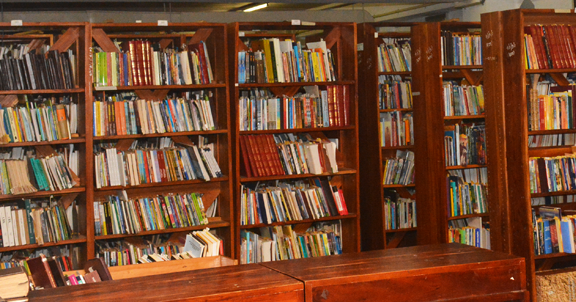 The main reference collection contains Tertiary Sources such as general and subject Encyclopedias, Dictionaries of English Language, other languages, Bilingual Dictionaries and Subject Dictionaries, Composite and Subject Glossaries, Year Books, Almanacs, Directories, International, National and Subject Biographies, Maps, Atlases, Gazetteers, Guide Books, Hand Books, Manuals and Thesaurus, CD ROMs including Encyclopedia Britannica, Encarta, etc. In addition this collection consists of Secondary Sources such as National, Subject and Trade Bibliographies, Indexes, Indexing Journals namely, Science Citation Index, Social Science Citation Index, Abstracting Journals such as Library and Information Science Abstract plus Current Research (LISA) and Current Content. Although the majority of the reference sources are of international level, a complete basic reference collection relevant to Sri Lanka is also available. The National Library of Sri Lanka is a deposit library since 1976 and receives copies of Sri Lankan Publications under the Printers and Publishers Ordinance of 1885. However the building of the Sri Lanka Collection commenced since the establishment of the Sri Lanka National Library Services Board in 1970. Other methods of publications acquired to enrich the Sri Lanka Collection include purchasing, exchange of publications, gifts and donations. Other than general reference material, the National Library is interested in acquiring books published in Sri Lanka, books published on Sri Lanka in foreign countries and books by Sri Lankan authors. As the leading institution in the field of Library and Information Science, National Library maintains a comprehensive and an up-to-date collection of materials on Library and Information Science. The Library and Information Science collection of the National Library is considered one of the country’s best collections in this field. This collection contains reference sources such as Encyclopedia of Library and Information Science etc., Glossaries pertaining to Library and Information Science. Primary sources such as Monographs, Conference Proceedings, Reports and all leading professional journals. Online version of Library and Information Science Abstract (LISA) provides up to date information on researches and publications in the field. Special facilities have been provided to the teachers and students of the institutes of Library and Information Science to use this collection. National Library commenced building up its S & T collection since 1989. At the beginning National Library acquired reference sources on S & T. This collection consists of printed and electronic sources on Science and Technology which are useful for the readers in this field. In acquisition of foreign materials, National Library aims at collecting materials published abroad having a bearing on Sri Lanka. This collection contains material received under the International Exchange Programme, by purchases and donations. Rare books are acquired according to criteria. This collection includes books that were printed privately or in limited editions and books that are irreplaceable unique or out of print. The rare book collection consists of books on subjects such as History, Politics, Economics, Literature, Culture and Social affairs of national importance. With the intention of expanding the present collection of rare books, requests have been made through newspaper advertisements to acquire rare books on Sri Lanka, rare works published in Sri Lanka, rare and old books written by Sri Lankan authors. This collection consists fictions and other materials for children. Collection contains material received under deposits, purchases and donations.